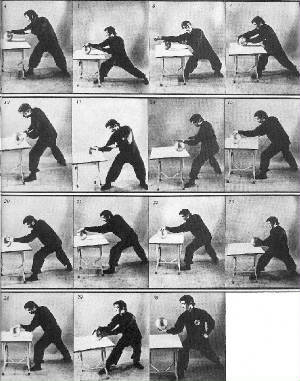 There are important 'auxilliary' or add-on exercises that are used to develop apprehension of the exercise and to develop the physical intelligence to move with the motion without deliberation. In general, these are refered to as xian tian 先天 innate or natural sourced skills usually categorized as a energy-flow 氣功 chi-kung [qi-gong]. Collectively, there are three main exercises, but only one will be shown here. Tai chi chih = ruler 太極尺 [note not confuse with 尺 chě one of the characters used to represent a musical note in gongche notation ] 尺 chǐ a Chinese foot measure, one-third of a meter, a ruler, a tape-measure, and also one of the three acupoints for measuring pulse in Chinese medicine. The named Hun-Yuan Yi-Qi, Primodial Unified-Non-Dual Qi Palm', could easily be used as a more esoteric cosmological name for any exercise. Hun-yuan or Wan-yun appears in connection with swirling, torqueing, twisting, turning over exercises said exiting from various sources: WuTang-hun-yuan, Chen TaiChi hun-yuan [silkreeling] and is applied also to the mobility-sensitivity ball-rolling exercise Hun-Yuan-Liu. It is a central concept and patterning of exchange. Liu-He could become the Yi-He, singular-unified harmony or reversed to He-Yi, harmony as/to one. Ba-Fa, could easily be said as eight-methods, standard methods or methods ...to a standard, a standard of the universe or to a proto-original cosmos. Similarly, Ai-Ki-Do could be said as He-Qi-Dao, 'unified' harmonious Qi, or Yi-Qi, unified Qi, to the standard of Dao, the guiding path, alternately to the standard of the proto-original, the Yuan. 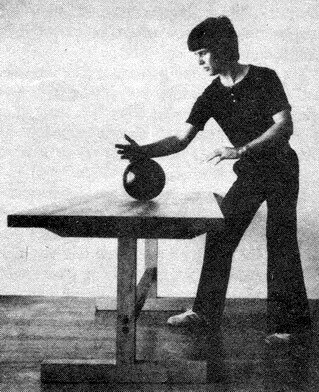 The method includes: a ball, a table, and an exercise. + the table can be of any material, but usually is about waist height. also a student of Chen YikYan. [His video clips are viewable on YouTube] My third LHPF teach 'Moon', met him and observed his ability with this practice method; he said he observed him roll and then project a wooden ball off the table, and 'shoot' the ball across the courtyard of his garden-home to a wall where the ball then rolled 'up' the courtyard wall. Moon also said he observed Kam Tung perform publically and performed 'fa-jing' power pulse, by projecting a demostrator off the platform. 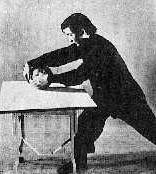 Alternatives to table-ball rolling/lifting exercise, is taiji-qigong-ruler exercise, which although normally done with a stick-ruler, can also be done with a ball. A ball, floating in water or even a bag of water can be practiced with. A ball supported and suspended on a string is another training aid. 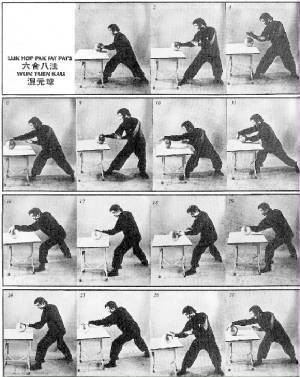 The reciprocal to 'embracing' an object is 'expanding' to an object, this is done with a loop-circle of bamboo or similar material; this is often associated with WingTsun-training, but is neither unique nor exclusive to that exercises origins or development. The limitations of training methods are your own imagination. P.O. Box 39938, Los Angeles, CA 90039.